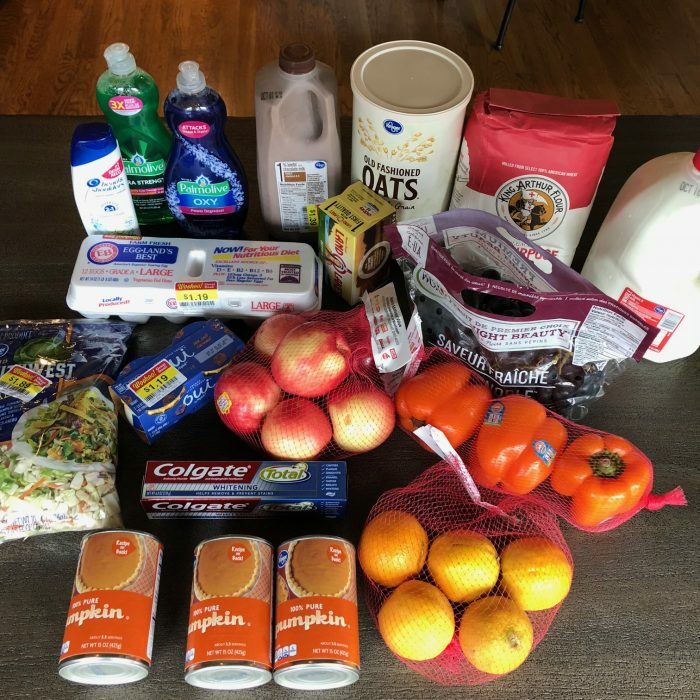 I like seeing others’ grocery trips, period, so however you choose to share them, I really enjoy these posts. I also enjoy seeing your sisters’ trips with photos. 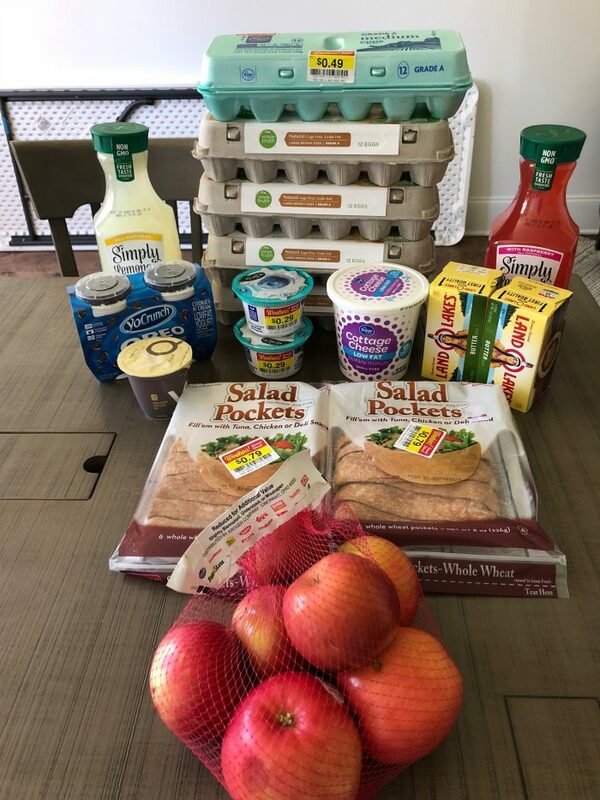 It completely makes sense that the trips don’t have to match what you eat because I am the same way with my meal planning and shopping. We eat out of the freezer and pantry and then shop to fill in staples and get fresh produce and dairy. I like this new format. I’d love to see pics of your meals, too. This might be weird ;), but I’d also like to see how stocked your freezer and cupboards are since you frequently say you pull from their to make your meal plans. It’s good! some fun rotations I would like to see would be – maybe a photo of prep day, i.e. getting ready for those breakfasts and lunches; maybe a shot of your dinner meal ready to eat with perhaps a before of the ingredients? and do you ever have days when it’s 4:30 and all your food is still frozen and what do you do for dinner then? ak! lol. The kids actually make their own lunches each day (usually at night before bed) and then we all are just on our own for breakfast, so it’s probably a lot less organized and boring than you might be envisioning! 😉 I shared a BUNCH of dinner prep pictures when I did the Eat at Home Challenge a few weeks back. I’ll try to share some here and there on these posts, too. It’s definitely keeping it real. Menu’s often change as a result of changes in plans or deals found at the store. Like it. Yes! That’s definitely what happens around here! Love your “realness” because some days you just have hot dogs, leftovers, cereal, and eggs for dinner. Makes me feel better knowing I’m not alone! However, I have to ask…are those really the only snacks you guys eat?!?! Ha! I would say we eat fairly healthy and have an active family, but my snack line would include: ice cream, goldfish, crackers, snack mix, rice cakes with pb, and cheezits for my husband;-)! This is an area we need to improve on! Those were the snacks we had this week… but it changes from week to week depending upon what I get on sale at the store. 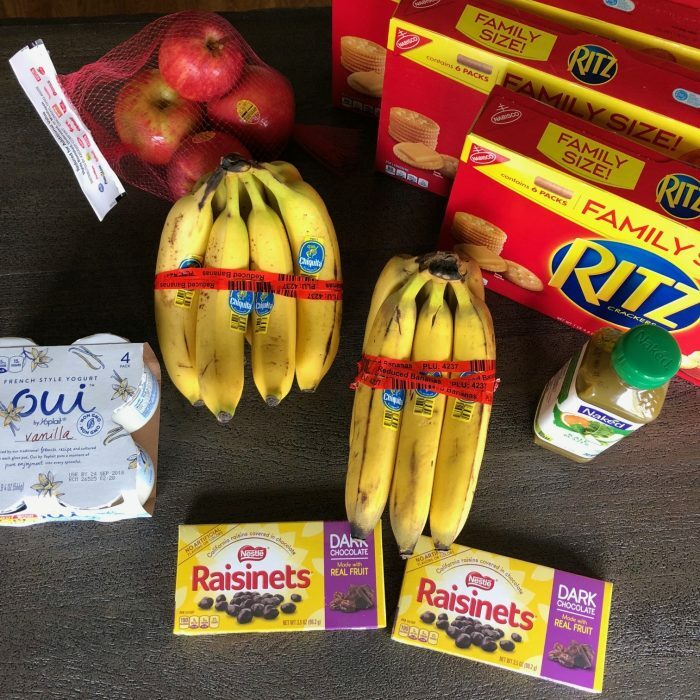 🙂 Also, the kids always get one treat in their lunch every day, so typically, I encourage them to choose something healthier for other snacks. I like this new format as well. We have a Kroger near church so I can go on Sundays for sure. But I think I will have to make more of an effort during the week to catch some markdowns. I did notice that some locations have cheaper markdowns than others (I guess because the price is up to the managers). I do find lots of markdowns at our Aldis just two miles down from home- baked goods and meats. Once they marked down value-packs of chicken breast for less than $1! YES! That is so true that some locations have cheaper markdowns than others! And some of them have cheaper markdowns on certain items and more expensive prices for markdowns on others. This format is much easier to follow. The “what I spent” summary would be great before the menu plan, right after your last shopping trip…my mind bounced from budget to menu to budget again. But again, I love this format, much easier for me to follow a one week summary 🙂 I enjoy these posts. That’s a good suggestion — thank you! Oh expanders (and later braces)! Yes, two of our kids had those! Soft foods, definitely!! It’s a whole new world we’re venturing into! And it feels like we’re probably going to be doing this more than once! Yes! I love his format! I enjoy this post so much every week. It really inspires me to keep our grocery budget low. Thank you! 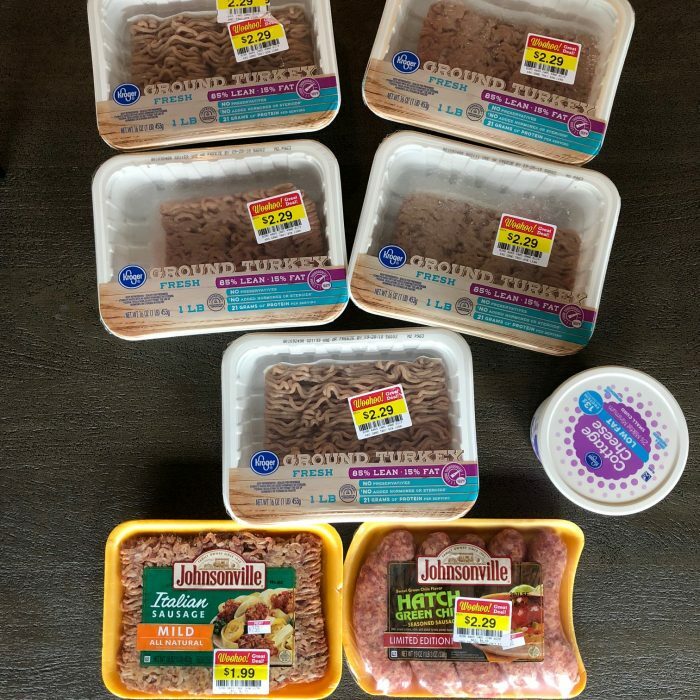 I’d love to see your meal and a breakdown of what items you purchased marked down were used to create it. On the “buy 5 participating items” at Kroger do you have to buy 5 of the same like items or can you buy 5 items as long as they are marked? You can mix and match any 5 items! It is buy any 5 of the participating items. And sometimes they will have 2 or 3 sections that are buy 5 or 10 or whatever. You can mix and match with all the sections. When I first started shopping at Kroger I thought it was within that section…lol. There are things though that are buy 5 of this item… those do need to be the same, just gotta watch the wording. I love seeing what you’re eating and what you bought! No matter how you set it up, it’s encouraging! I live southern Ca and don’t see all the markdowns at my store. I’m going to ask the manager if there is a good day for me to catch markdowns. I feel like $70 is too low for my area but I did cut the bill down by from 150 to about 80- 100 a week with your tips and posts!! That’s AMAZING! Way to go!! I love this new format! Sometimes I get discouraged because I don’t think I am doing well, compared to your budgeting/cooking. Seeing your real life meals makes me realize that I can do this! Thanks for changing it up and keeping it real! You are amazing!! Fend for yourself dinner is my favorite!!!!! Except we call it DIY night. I see it as teaching my kids how to take care of themselves. They won’t always live at home. If you can make Mac n Cheese at 11 can’t wait to see what’s to come. The OUI yogurt jars are amazing DIY jars (search Pinterest) or to clean out and use adhesive remover on the lip of the jars then use them for juice or small serving smoothies. Your perspective on DIY night really encouraged me! It’s truly my desire to raise independent kids as much as I can! We call Sunday night “Clean out the fridge night”. I think we could also call it “If you want it, grab it before your sibling does” night. LOL! We call it YOYO night! You’re On Your Own! Or Yo On Yo Own as we like to pronounce it! Love this format. I also like your sister’s shopping trips and menu plans. I just find them fascinating…and very real. I learned how to do the Friday downloads this week and got the free yogurt, too. I’m quite proud of myself. ? I find your frequent trips to the store for the markdown items inspiring. It reminds me to look for them at the store and not to be afraid to buy them. YAY for getting the free Friday download!! I just chopped $114 woohoo. Massive stock up!!! I love these posts, even though they make me miss having a Kroger (we are stationed overseas in the Middle East)! Coupons and mark downs don’t really exist here out in town. But our base Exchange recently had snack food and cereal on clearance – we bought 2 cases of Cinnamon Life cereal (28 boxes) for $1/box (normally $5.49) and 15 bags of goldfish for $1/bag (normally $2.99). Gotta grab the deals when they have them! That’s so fantastic that you found those deals — way to go!! I tell every mom who’s dealing with expanders- stock up on popsicles!!! They made the expander turning so much easier. Have your kid eat half the popsicle to get their mouth nice and numb. Then do the turn and have them eat the other half. Hardly any pain! It was a life saver for us. Maybe you can find some marked down!! I like the new format, although I’ll miss the daily videos! I never knew about the markdowns until you showed us. Went looking yesterday and saw a few! Is there a better day or time to go? Do you walk down every aisle? Thanks so much for your tips! I’m still doing daily videos! Are seeing them on FB and IG stories?